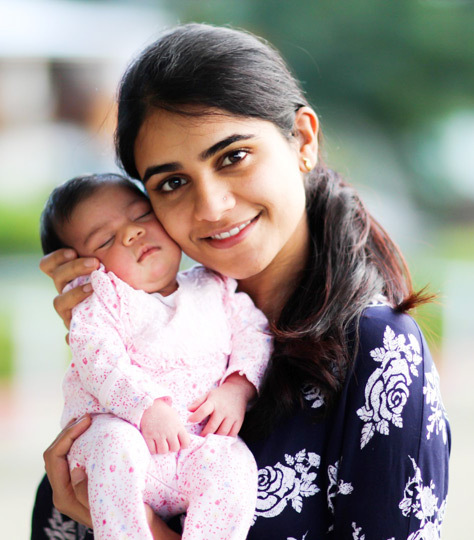 "Nandini Periwal was was born on 23rd June at 22:29, a day before her due date. We had a successful drug-free calm natural labour. Contractions started at 16:00 on 22nd Jun and active labour started about 12:00 noon on 23rd. We went to the hospital at 17:30pm and thankfully was 8cm dilated. By 22:00, I was fully dilated and 29mins later she arrived. I really think coming to Suzanne's Active Birth Yoga classes had a big influence on me (and my husband). I wasn't sure if I would have the composure to use all that I had learnt during the birth itself. However, a strange calm came over me during labour, I went deep into myself and felt like I had shut the rest of the world away, at one point I was humming my favourite song. I used breathing techniques Suzanne taught me to urge the baby down and as natural pain relief. I used the “cat” pose and other positions in the shower which I learned during the classes. This was very helpful and no doubt sped things up. Suzanne taught us the techniques to keep calm, focused and be able to normalise the surges throughout the birth. In my labour I visualised the physical changes that were taking place inside my body to allow the baby to come out, and also the journey the baby was making. I didn’t allow myself to focus on ‘pain’, but instead thought about meeting my baby at the end of the labour. I’m very grateful to Suzanne for teaching me and helping me to have exactly the labour I had wanted." Purnima attended Active Birth Yoga and a Private Session with Suzanne.